Heard about the stunning “mothership” campus that Apple wants to build as its new HQ?Â Here’s a complete run-down, along with a gallery full of artist renderings showing exactly what this architectural wonder will look like. 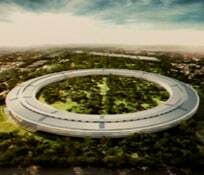 Not far from its current offices in Cupertino, California, Apple recently snatched up about 150 acres of land (from Hewlett-Packard, of all people), and wants to build this massive, wheel-shaped facility that can house up to 12,000 employees. In a presentation to the city council of Cupertino (see video, top), Steve Jobs himself outlined his company’s desire for this enormous new campus. (The presentation unfolds not entirely unlike one of his famous keynotes, complete with Powerpoint slides.) According to Jobs, Apple’s business continues to grow so exponentially that they’ve got about 9,000 more people on staff than they currently have room for at their home campus, which is famously located on a street called “Infinite Loop.” Those extra employees are clocking in to work at more than 60 buildings all over Cupertino that Apple currently rents. To bring all of them under a single roof, Apple would like to build this enormous, environmentally-friendly building by 2015. Instead of the typical “office park” model where various departments get their own structures, Apple is committed to putting all 12,000 employees under a single roof. A roof designed byÂ British architect Norman Foster. Foster is widely regarded as one of the best architects in the modern world, with dozens of famous structures under his belt including London’s bullet-shaped skyscraper at 30 St. Mary Axe and Wembley Stadium. Foster also did the massive one-and-a-half mile long Millau Viaduct in southern France. The new Apple campus would be four stories tall, and would be completely walled in with curved glass — which is not an easy feat. The “green” building would supplant the current HP campus, and return a great deal of the land to nature. The campus would include a vast parking garage that would be mostly underground, as well as a huge auditorium for those keynote presentations. An enormous cafeteria inside the main structure will feed 3,000 employees at a time. And a dedicated “energy center” would generate most of the campus’ power needs without drawing much from the city’s grid. When all is said and done, Apple’s new facility will have 3.1 million square feet of space. And it looks like Jobs will get his wish: one day after Jobs’ appearance at the council meeting, Cupertino’s mayor announced that they had approved Apple’s plans for the facility. The city says it expects Apple’s beautiful, state-of-the-art campus to become something of a tourist destination for the small town. Factor in the jobs and taxes the facility will generate for Cupertino, and they’d have been flat out nuts not to approve. BTW, Steve Jobs doesn’t use PowerPoint. He uses Apple’s own Keynote presentation software. He’s been using Keynote since before it was released publicly back in 2003. It’s now up to version 5 as part of iWork. I very much doubt that Jobs gave a Powerpoint presentation to the Cupertino City Council. I know it’s a nitpick but I’m pretty sure it was a Keynote presentation. Sorry, all. I didn’t mean to suggest that Steve was using the actual “Powerpoint” software, though it certainly looks that way, doesn’t it? In my head, I was using “Powerpoint” more as the broad term that all slide/presentation software sometimes falls under. The way that all tissues are often called “Kleenex,” or all bandages are called “Bandaids.” It was gross negligence on my part to make it sound like Mr. Jobs would use anything other than Keynote for his slides.